The sizes of Dea sandals are standard, if your shoe size is 38 you have to choose the sandals size 38. To be more precise and to order a pair of sandals which are your right size, you can follow these simple instructions. NB WARNING: Prior to printing make sure to turn off between the "option settings fits the image to the frame". 2) Check the indicator reported in the document with a real measure, if the dimensions match the document was printed on the correct proportions. 3) Place the ball of your foot on the printed form and place it perfectly inside the dashed border. 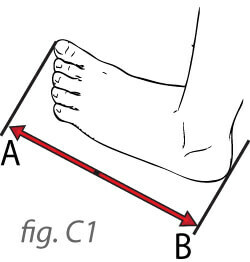 If the sole of the foot leaves the dashed border or if there is room for too much space, select a file from the table corresponding to a lower or higher dimension. 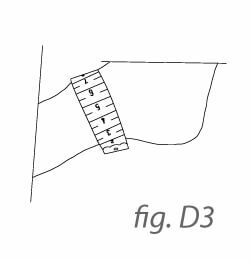 To find the right size if you do not have a printer or to perform a quick scan, you can measure the foot length as shown in photo C1. Find the match between the foot length and the right size in the Measurements table above. 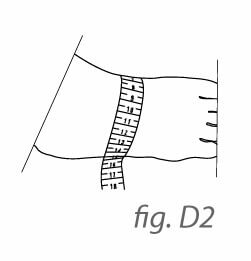 To provide the measurement of the neck of the foot we need to place a common tape measure on the foot neck by measuring the measurement from point X to point Y, see photo D2, D2 and D3. For all our sandals offered in the hockey, you can select the size of the heel from the drop-down menu on the tab of the single product. The price indicated refers to the sandal with 1,5 cm leather heel. The price difference in the choice of the heel from 2.5 cm onwards is due to craftsmanship and the use of full leather woven leather. If you have any doubt about how to find the right size for your sandals, please contact us, our customer service will guide you in the right choice.